Anthony's entertaining, if somewhat uneven, 29th Xanth book (after 2004's Currant Events) follows the polite, generous and even-tempered Goody Goblin-an anomaly among males of his race, who are usually crass, unkind and violent-as Goody tours Xanth on a quest to dispose of a foul-mouthed bird known as the ""Pet Peeve,"" which can mimic anyone's speech. Accompanied by the tough Hannah Barbarian, one of Anthony's most completely realized female characters, Goody passes through many parts and meets many people of Xanth, none of whom is willing to take the dangerously annoying bird off his hands. 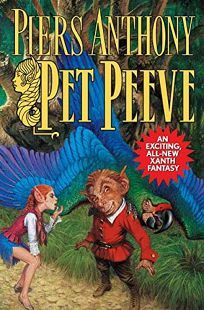 The journey is rife with the kind of oddball humor typical of the Xanth series, such as the early episode in which Goody is given ""the Finger,"" a detached human middle finger that comes in a box and pokes and prods anyone who possesses it. By the usual happy ending, Goody may have found a new love-or maybe not. Even more jumbled than the average Xanth novel, this one is strictly for the faithful.